It’s time to the restaurant edition of Replace, Refurbish, or Leave Alone. I’m going to choose three restaurants. You and I will choose to replace it, refurbish it, or leave it alone. You can replace the restaurant with any style restaurant that you can think of. It could be a new character meal, a new signature-dining experience, a new quick-service restaurant. Whatever your Imagineering Sorcerer’s Hat wants to create. Refurbish simply means a restaurant that is still good in your opinion but just needs some freshening up (Brighter themeing, a subtle change to the theme, maybe expand the restaurant to accommodate more guests). Nothing major just some little tweaks to make a good restaurant, in your opinion, a little bit better. Leave Alone is self-explanatory. This restaurant is perfect, in your opinion, nothing should be changed about it. There are many things that I like about Le Cellier. However, there are also many things that I don’t like about the restaurant as well. First, it’s size. It’s too small and the tables feel really close together. So, the first thing I would do is find a place within the Canada Pavilion to move the restaurant to in order accommodate more guests. Le Cellier is a hard reservation to get and this is mainly due to its size. Second, I would vary up the menu. There are many places to get steak, etc. at Walt Disney World but not a whole lot of places to get a good seafood dish. I would incorporate more seafood on to the menu. The restaurant is located in the Victoria Gardens portion of the Canada Pavilion which is modeled after Butchart Gardens in Victoria, British Columbia. Victoria is a seaside town so add some more seafood to the menu. 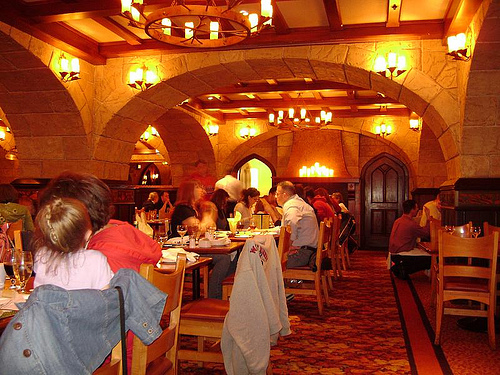 Given, the small footprint of Le Cellier, I would put in a quick service restaurant in its place. And no place in Canada does quick service better than Tim Horton’s. A Tim Horton’s quick service serving donuts, coffee, along with sandwiches and soups would be a great addition to the pavilion. 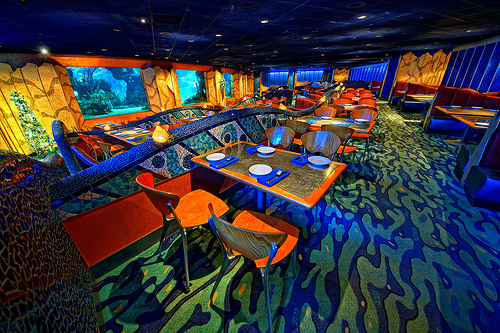 I like Coral Reef as a restaurant. The food was good. The atmosphere was nice sitting there watching the fish go by as you eat. However, my main problem with the restaurant was it was too loud and it was too dark. I would keep the theme of the restaurant the same but find a way to raise the ceiling to alleviate the noise problem and add some lightening or brighter colors to give the impression that the restaurant is bright. I felt like was under ground in a cave when I ate there. Biergarten is the one restaurant on this list that I haven’t eaten. I do know people who frequent this restaurant and like it….a lot. 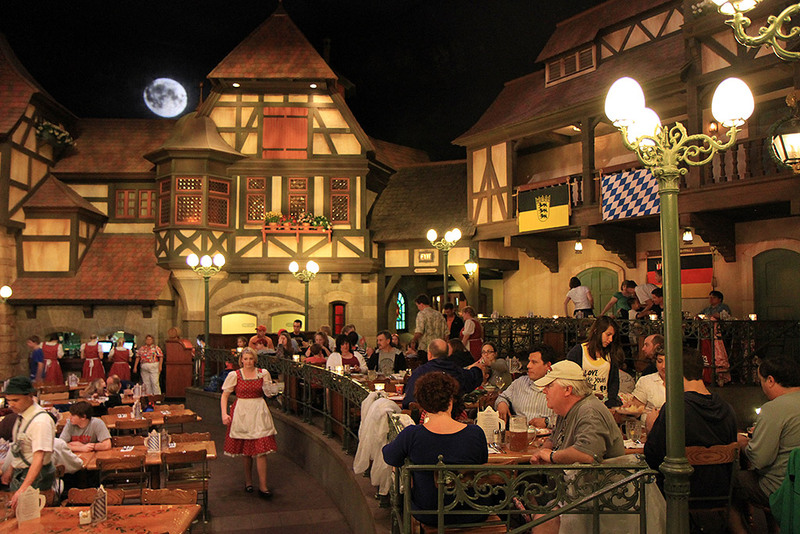 It is a prototypical German beer hall. Family style seating, buffet serving hot and cold German cuisine, loud music and dancers performing on stage. It sounds like a fun place to go have a meal. So, why haven’t we gone yet. My daughter is not a fan of German food and we usually go on the dining plan so it isn’t a good value for us right now. Maybe, over time, her palate will change and will give it a go. Those are my choices. What are yours? Be sure to vote in the poll questions above. The first giveaway at the Dad For Disney Facebook Group is coming in its final days. Be sure to head over to the group and click on the giveaways tab to get your entry in before the deadline on midnight September 16th. Tim! I loved this! So much fun!